(Nanowerk News) The California NanoSystems Institute (CNSI) at UCLA and the Centre for Nanoscience and Quantum Information (NSQI) at England's University of Bristol have entered into an agreement to expand research collaborations and educational exchanges in nanoscience and nanotechnology. CNSI director Paul Weiss and NSQI director Daniel Robert signed a memorandum of understanding at a March 2 ceremony on the UCLA campus. The MOU forges a link between two of the world's foremost centers for nanoscale research, allowing them to apply their combined resources in nanotechnology to problems of global concern in energy, health and the environment. 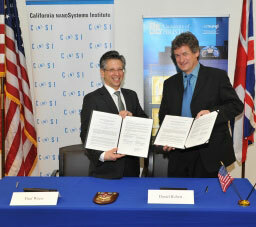 CNSI director Paul Weiss (left) and NSQI director Daniel Robert at the UCLA signing ceremony. "This is a landmark event for CNSI," Weiss said. "It is our first MOU with a European institution and will provide access to advanced instrumentation and new approaches to nanoscale research. The joint research and education efforts of CNSI and NSQI members will provide benefits of worldwide importance." "Current collaborations between individual members of CNSI and NQSI will be strengthened by this agreement," Robert said. "It raises these partnerships to an institutional level, giving the researchers involved access to the full resources of UCLA and the University of Bristol. The MOU will accelerate the flow of people and ideas between the U.S. and the U.K."
The memorandum is the culmination of a series of research interactions that began with a collaboration between the CNSI's Jim Gimzewski, distinguished professor of chemistry and biochemistry, and NSQI's Mervyn Miles. The University of Bristol was one of two U.K. university participants in a workshop on nanotechnology held at the CNSI in 2009. Currently, three members of NSQI are spending a week in residence at the CNSI as part of a program funded by the British Research Council to encourage academic exchanges between British and American universities. Weiss will travel to Bristol for the official NSQI opening this September. The CNSI carries out both basic and applied research, all focused on increasing the understanding of phenomena at the nanoscale and finding applications for nanoscience and nanotechnology in the fields of energy, medicine, communications and the environment. Specific areas of research include renewable energy; cancer care, including diagnostics, therapies and targeted drug delivery; nanotoxicology; biosensors; and graphene production. Research at the CNSI is based on the assumption that scientific inquiry is borderless, transcending political boundaries, and is advanced through international partnerships and collaborations. The agreement with NSQI continues the efforts of the CNSI to play a leading role in the globalization of science. Over the past three years, the CNSI has created formal links with the Chinese Academy of Sciences, the Beijing Nano Center, the University of Tokyo, the University of Kyoto, Kyushu University, Yonsei University, Seoul National University, KAIST and the University of Bristol. The Bristol Centre for Nanoscience and Quantum Information provides state-of-the-art specialized laboratories whose vibration and acoustic noise levels are among the lowest achieved anywhere. The center also has a unique purpose-designed environment in which a multidisciplinary and interdisciplinary research community drawn from science, engineering and medicine can be fostered and thrive through stimulating interactions and the exchange of ideas. The California NanoSystems Institute at UCLA is an integrated research center operating jointly at UCLA and UC Santa Barbara whose mission is to foster interdisciplinary collaborations for discoveries in nanosystems and nanotechnology; train the next generation of scientists, educators and technology leaders; and facilitate partnerships with industry, fueling economic development and the social well-being of California, the United States and the world. The CNSI was established in 2000 with $100 million from the state of California and an additional $250 million in federal research grants and industry funding. At the institute, scientists in the areas of biology, chemistry, biochemistry, physics, mathematics, computational science and engineering are measuring, modifying and manipulating the building blocks of our world ? atoms and molecules. These scientists benefit from an integrated laboratory culture enabling them to conduct dynamic research at the nanoscale, leading to significant breakthroughs in the areas of health, energy, the environment and information technology.